The Washington State Republican Party said Dino Rossi made the announcement about running for the 8th District seat during the party's annual dinner. Republican state Sen. Dino Rossi says he’ll run for Congress in the 8th District to replace retiring U.S. Rep. Dave Reichert. Rossi, whose entry into the race had been anticipated for weeks, announced his 2018 campaign at the Washington State Republican Party’s annual dinner Thursday night in Bellevue. In a Facebook post, Rossi wrote, “Congress is broken and needs fresh leadership,” and that “most of our leaders in D.C. seem too absorbed in scoring political points instead of working to fix problems.” He declined an interview request Friday through a spokesman. As a well-known politician who has run unsuccessfully three times for statewide office, Rossi’s entry into the race could cheer Republicans hoping to retain the 8th Congressional District seat and maintain the status quo in Washington, D.C., where the GOP controls the House, Senate and White House. National political analysts see Reichert’s seat as a top pickup possibility for Democrats seeking to flip control of the House in next year’s midterm elections. Rossi’s entry doesn’t immediately change that picture, said Kyle Kondik, managing editor of Sabato’s Crystal Ball, a nonpartisan elections and politics newsletter published by the University of Virginia. “It’s still a toss-up as an open seat, but Rossi gives the Republicans a very credible candidate who has carried this district in past races. This is a recruiting win for House Republicans but this is still a tough seat for them to hold,” Kondik said in an email. A Sammamish resident, Rossi, 57, previously served in the state Senate from 1997 through 2003, when he chaired the Ways and Means Committee. He was appointed last year to fill a state Senate vacancy in the Eastside’s 45th Legislative District after state Sen. Andy Hill died of lung cancer. Rossi is best known for his 2004 gubernatorial race, in which he nearly defeated then-Democratic Attorney General Chris Gregoire. Initially declared the winner, Rossi lost by just 133 votes after two recounts and a failed lawsuit. He lost a rematch with Gregoire in 2008 by 195,000 votes. In 2010, he lost an attempt to unseat U.S. Sen. Patty Murray by about 119,000 votes. Last year, Rossi was a delegate to the Republican National Convention in Cleveland, Ohio, where he supported Donald Trump’s nomination for president and criticized other delegates who tried to mount a last-ditch anti-Trump rebellion. The 8th District includes the eastern portion of King and Pierce counties and stretches across the mountains to Central Washington. It has always been held by a Republican since its creation in 1983. But in presidential races, the district was carried by Hillary Clinton in 2016 and Barack Obama in 2012. Another possible GOP candidate, King County Councilmember Reagan Dunn, said Friday he will not run for Reichert’s seat next year. Dunn said he made his decision a couple weeks ago after meeting Rossi for breakfast. “It wasn’t the right time for me,” said Dunn, who added he’ll back Rossi. State Republican Party Chairman Susan Hutchison said Rossi’s decision is a good sign for the GOP. “Democrats should prepare for an uphill battle if they plan to challenge one of Washington’s beloved Republicans in a historically conservative district,” she said in a news release. But Democrats dismissed Rossi as old hat. 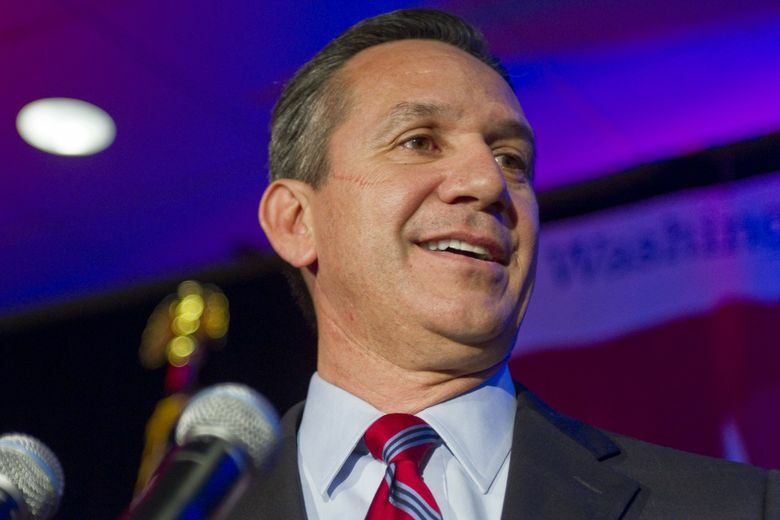 “Dino Rossi is a three-time loser candidate. From his anti-choice, anti-woman policy stances, to his support for lowering the minimum wage and his allegiance to corporate interests, Washington voters have repeatedly rejected Rossi’s extreme views,” said state Democratic Party Chair Tina Podlodowski in a written statement. “Voters were smart enough to reject Rossi three times already and the voters will do it again. They have shown they don’t trust Dino Rossi to have their backs in this Washington, and I don’t think they’re going to trust him to have their backs in the other Washington either,” she said. Several Democratic challengers — none as well known as Rossi — have announced their campaigns, including Issaquah Councilmember Tola Marts, pediatrician Kim Schrier, former King County deputy prosecutor Jason Rittereiser, Amazon software developer Toby Whitney and business owner Mona Das. Reichert announced his decision to retire from Congress earlier this month, saying he had no immediate post-Congress plans but intended to remain involved in public service. It’s not yet clear whether Rossi will have an entirely uncontested run from Republicans in the primary. State Rep. Drew Stokesbary, R-Auburn, also has said he’s considering a run. Pierce County Councilmember Pam Roach also has been mentioned as a possible candidate.